When coaching engagements fail, it is far less likely to be a problem of insufficiently brilliant coaching than it is a matter of simple follow through. Seriously. Look in your own coaching, or mentorship or training you’ve provided for others. Chances are high that you were quite qualified to provide the sort of coaching and guidance you were charged to provide, both in your expertise and your ability to communicate that expertise. It’s the follow through where things typically fall apart, if they fall apart. It’s whatever happens in the days or weeks following a coaching session when you’re no longer there while the rest of generally busy life is. The spaces in between your coaching sessions are the real wildcard in your coaching and thus coaching results. Life comes up. Inspiration is perishable. Good ideas fade. We all wrestle with these truths as we strive to cause great outcomes with the people we coach. With surprising regularity, follow through and failure to follow through is a just matter of awareness. Assuming we are doing good coaching, we don’t set up our clients with an action plan that is unrealistic1. Also assuming we are doing good coaching, we don’t set up our clients with an action plan that isn’t meaningful and worth doing. So if a plan is genuinely doable (it should be), and worth doing (it should be), then just plain forgetting about it is the most likely opportunity for it to be derailed. The people you coach do this too. Forgetting is the default, and without a real structure to remember that’s better than “I’ll remember to check on this later when I’ve got a few minutes” it will be exercised with frightening regularity. Now then, you can’t be looking over the shoulders of the people you coach all the time, but you can put some structures in place for the people you coach. This is what CoachAccountable has been rigorously polished to do in a smooth and unobtrusive way. When your client creates an Action in CoachAccountable, they are simply entering the “What” and the “By When”. It only takes a few keystrokes and clicks to set up an action, and the boost that this creates for follow-through is surprising. But beyond that, Actions come with reminders. The system suggests 2 by default as a useful nudge2. As many as desired can be set, just a few clicks and all relative to the due date. Reminders are the way to keep the action plan alive and in motion between your coaching sessions. 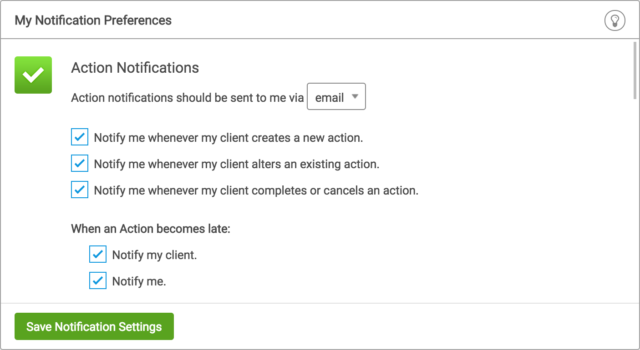 Because your client can respond to a reminder (either by email or text) to mark the action done, it’s very little work to keep current with what’s done and what’s not. Better yet, it’s satisfying to mark actions complete in a purely hedonistic way. It’s the gamification of follow through. 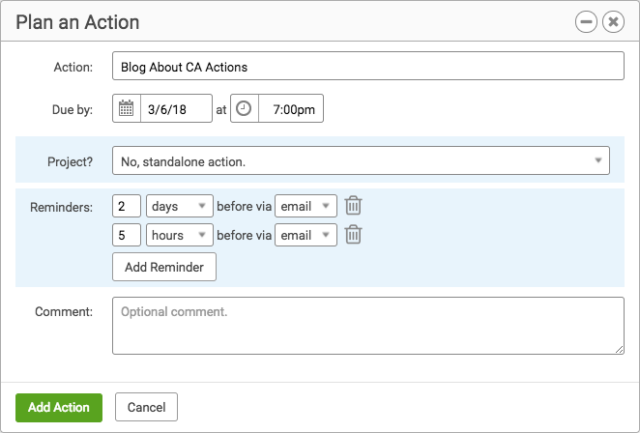 When clients mark an action complete via email, a reply comes back letting them know how they did relative to the due date. Satisfying. Getting too much information in your inbox? You can turn these on or off at any time. Now this is where it gets to be like CoachAccountable is an angel sitting on your shoulder, helpfully whispering in your ear what’s happening (or not happening) with all of your clients as the weeks progress. You might prefer to remain hands off until next session, but you also might find you can do a world of good by offering your clients a quick check-up mid-week if nothing is getting done. So that’s what CoachAccountable Actions can do for your coaching. There’s no silver bullet to making the people you coach fulfill on everything they set out to fulfill, but believe me, taking “I forgot” off the table goes a long way towards ensuring your brilliant coaching advice gets acted upon, and your clients get the results they came to you for. If you don’t already have a CoachAccountable account you can try one for free for 30 days, sign up and try our smart to-do lists and so much more.